. . . . -- PHONE or ONLINE ordering -- 404-634-8881 daily 9-9 EST . . . . . . The highest light output per watt - 100 watt brilliance, draws 18w. One of the most commonly asked questions about lighting concerns the effective and proper usage of full spectrum (or FS) lighting devices. The quality of this full-spectrum light is unsurpassed, and reasonably price. Fits into practically any fixture, and is economical to operate. Delivers approx. 75 watts of light, and draws only 18 watts of power. 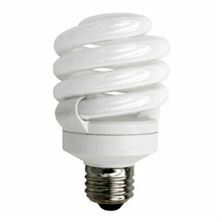 Effectively lasts 12,000 hours, or the bulb-life of twelve conventional light bulbs. Full-Spectrum light is necessary for the proper utilization of calcium. Full spectrum light does not pass through window glass or plastic, so unless pets or humans spend time daily in direct sunlight, it can develop serious deficiencies. The real effect of lighting upon general health and behaviors is brought about by a balanced visual spectrum. Supplement artificial lighting whenever possible with natural unfiltered sunlight, and feed a high quality balanced diet. This combination of factors will meet all of your requirements for lighting and nutrition. (1). Natural sunlight at high noon in the equatorial regions is considered a CRI (color rendition index) 100. The combination of sunlight and skylight combine to form a Color Temperature of 6500k. A lamp with a CRI 94 or greater is recommended. (2). This Internet study was conducted by the author in the first quarter of 1999, and contained a representative sample of 500 aviculturists from all levels of competence. A sample this size allows for a 96% confidence level that the answers gained are statistically valid, and are typical of general birdkeeping practice. (5). Lamps and Lighting: A manual of lamps and lighting application. 1983. Third Edition. Cayless, M. A., Marsdep, A. M., Eds. Edward Arnold: Baltimore; Duro-Test Corporation Commercial Engineering Technical Specifications E1-10 & 40T12 R.S. (6). Vision, Brain, and Behavior in Birds. 1993. Zeigler, H. P., Bischof, H. J., Eds. MIT Press: Cambridge, MA. (7). Dr. John Ott worked with Duro-Test in the late 1960's, to develop and produce the Vita-Lite. He later spun off his own company incorporating FS lamps into specialty lighting housings. He sold out his interests and rights to that company, Ott Biolite in the early 1990's.
. . . .Order now ONLINE . . . or order by PHONE 9-9 EST. . . . . .